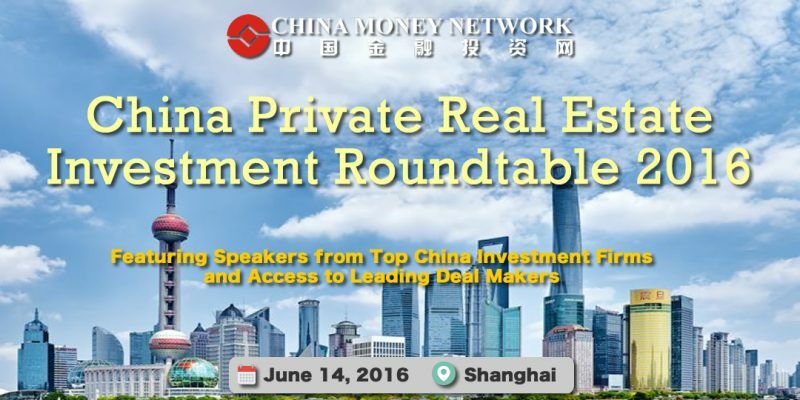 Shanghai, China, May 27, 2016 /ChinaNewswire.com/ - China Private Real Estate Investment Roundtable 2016, organized by China Money Network, will gather China's most successful private real estate investors from leading deal makers from Kai Long Fund, Everbright Ashmore, CITIC Capital, V Capital and more. The high level event, to be held from 16:30 to 19:30 on Tuesday, June 14, 2016 in Shanghai World Financial Center will offer attendees opportunities to network with top Chinese investment firms and real estate industry executives over an insightful roundtable discussion and a cocktail reception. After decades of rapid growth, China's institutionally invested real estate space was estimated to be second only to that of the US, at US$806 billion in 2015. But as China's property market enter a paradigm shift away from the rapid price appreciation and growth of the past, how do private real estate investors find and execute a niche strategy to achieve attractive investment returns? The speakers will engage with the audience to offer valuable insights on the questions and more. Mr. Chien is a managing director in Blackstone's Real Estate group based in Shanghai responsible for real estate acquisitions and initiatives in China. Before joining Blackstone, Mr. Chien was an executive director at GreenOak Real Estate Advisors in New York, where he focused on acquisitions in the U.S., Greater China, and India. Previously, he worked at Morgan Stanley in their real estate investing and mergers & acquisitions departments in New York and London. Mr. Ching heads CITIC Capital's Real Estate business, which has invested in over 20 projects with aggregate asset value of over US$8 billion in residential, retail and commercial properties since 2005. Mr. Ching has over 20 years of professional experience in investment management, investment banking and corporate banking, having worked at the HSBC Group, Societe Generale Asia and Industrial Bank of Japan. Mr. Pan is the chief executive officer of Everbright Ashmore Real Estate Fund. Prior to joining Everbright Ashmore, he worked for the Foreign Exchange Reserve Department of China's State Administration of Foreign Exchange, and established SAFE Investment Company, Ltd., a wholly owned subsidiary of the People's Bank of China which had assets-under-management of more than HK$20 billion. Previously, Mr. Pan worked at asset management firm Seagate. Mr. Cheng is the founder and chief executive of Kai Long Fund, with over 30 years of real estate experience in the Greater China region. Since co-founding the firm in 2004, Mr. Cheng has led the firm to invest in 30 real estate projects valuing over US$1.5 billion combined. Before KaiLong, Mr. Cheng was the general manager of Shui On Land, having overseen the development of Rainbow City, Hangzhou Xi Hu Tiandi, and Shanghai Xintiandi. Mr. Ding is the chief executive officer of V Capital, a newly established real estate investment fund established by one of China's largest real estate developers, Vanke Group. V Capital focuses on investing in core assets, growth and opportunistic assets in China's real estate sector.